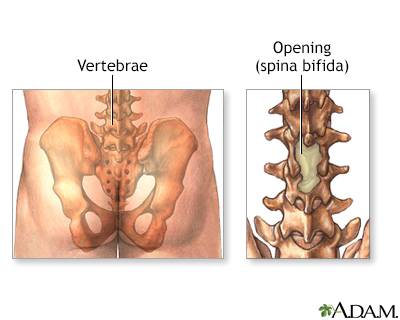 Meningocele repair (also known as myelomeningocele repair) is surgery to repair birth defects of the spine and spinal membranes. 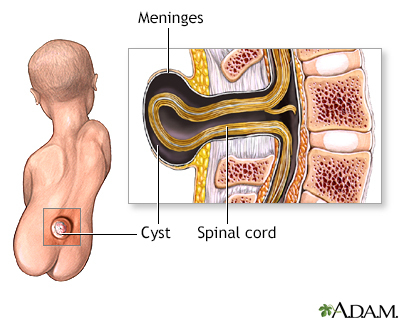 Meningocele and myelomeningocele are types of spina bifida. 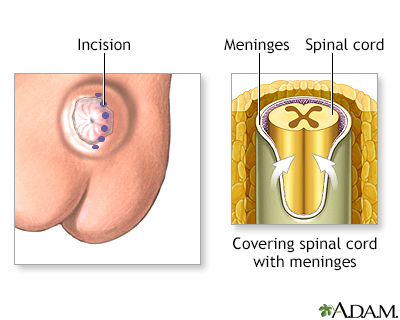 For both meningoceles and myelomeningoceles, the surgeon will close the opening in the back. After birth, the defect is covered by a sterile dressing. Your child may then be transferred to a neonatal intensive care unit (NICU). Care will be provided by a medical team with experience in children with spina bifida. Your baby will likely have an MRI (magnetic resonance imagining) or ultrasound of the back. An MRI or ultrasound of the brain may be done to look for hydrocephalus (extra fluid in the brain). If the myelomeningocele is not covered by skin or a membrane when your child is born, surgery will be done within 24 to 48 hours after birth. This is to prevent infection. If your child has hydrocephalus, a shunt (plastic tube) will be put in the child's brain to drain the extra fluid to the stomach. This prevents pressure that could damage the baby's brain. The shunt is called a ventriculoperitoneal shunt. Your child should not be exposed to latex before, during, and after surgery. Many children with this condition have very bad allergies to latex. Repair of a meningocele or myelomeningocele is needed to prevent infection and further injury to the child's spinal cord and nerves. Surgery cannot correct the defects in the spinal cord or nerves. A health care provider often will find these defects before birth using fetal ultrasound. The provider will follow the fetus very closely until birth. It is better if the infant is carried to full term. Your doctor will want to do a cesarean delivery (C-section). This will prevent further damage to the sac or exposed spinal tissue. Your child will most often need to spend about 2 weeks in the hospital after surgery. The child must lie flat without touching the wound area. After surgery, your child will receive antibiotics to prevent infection. MRI or ultrasound of the brain is repeated after surgery to see if hydrocephalus develops once the defect in the back is repaired. Your child may need physical, occupational, and speech therapy. Many children with these problems have gross (large) and fine (small) motor disabilities, and swallowing problems, early in life. The child may need to see a team of medical experts in spina bifida often after discharge from the hospital. How well a child does depends on the initial condition of their spinal cord and nerves. After a meningocele repair, children often do very well and have no further brain, nerve, or muscle problems. Children born with myelomeningocele most often have paralysis or weakness of the muscles below the level of their spine where the defect is. They also may not be able to control their bladder or bowels. They will likely need medical and educational support for many years. The ability to walk and control bowel and bladder function depends where the birth defect was on the spine. Defects lower down on the spinal cord may have a better outcome. Robinson S, Cohen AR. Myelomeningocele and related neural tube defects. In: Martin RJ, Fanaroff AA, Walsh MC, eds. Fanaroff and Martin's Neonatal-Perinatal Medicine. 10th ed. Philadelphia, PA: Elsevier Saunders; 2015:chap 65.